Who doesn’t want a 6 pack!?! Buy in BULK and SAVE + FREE SHIPPING on all orders > $150 Australia wide. Vegan bay-BEE … BEE-cause you asked for it HONEY FREE. 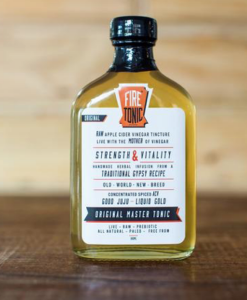 Adapted from a traditional Gypsy recipe and handmade in Torquay (on the Surf Coast), Fire Tonic is a raw, unfiltered apple cider vinegar (ACV) tincture, alive with the Mother of Vinegar. 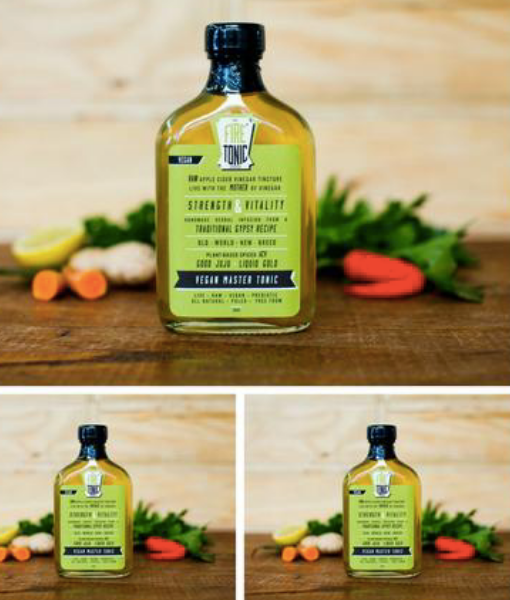 This herbal infusion is a potent immune booster and metabolic stimulant and is recommended as daily health tonic 10ml – 15ml 1 – 3 times per day. This ‘liquid gold’ is a great way to kick start everyday and keep on top of whatever ails you. 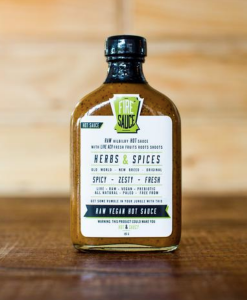 ACV, organic coconut nectar, chillies, turmeric, garlic, horseradish, ginger, carrot, celery, red onion, brown onion, apple, orange, lemon, mustard seed, parsley, rosemary, oregano, thyme, juniper berries, peppercorns, bay leaves, Szechuan pepper & Himalayan pink mineral salt. 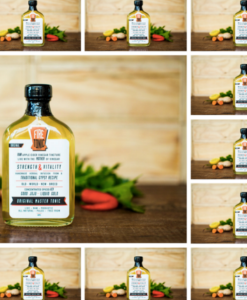 … many of the ingredients are organically grown at Hilbilby HQ with others sourced fresh locally where possible, each with its own medicinal, health and healing properties. We are also Locavores, supporting our local growers and real food community wherever and whenever we can. 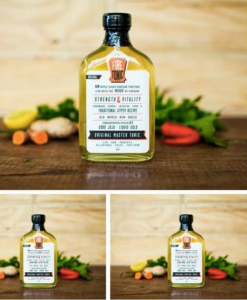 Hilbilby products are hand made in small batches and use local, fresh organic ingredients as seasonally available.Old world new breed, we are good for your gut! To return your product, you should mail your product to: 22 Baines Crescent Torquay Victoria AU 3228 You will be responsible for paying for your own shipping costs for returning your item. Shipping costs are non-refundable. If you receive a refund due to defective or damaged items, the cost of return shipping will be deducted from your refund. Our policy is valid for 30 days, if your purchase was 30 (or more) days ago, then these refunds or exchanges are not applicable. Only items purchased on the Hilbilby Cultured Food website can be returned for a refund or exchange. To be eligible for a return or refund, your item must be unused and in the same condition that you received it. It must also be in the original packaging and proof of purchase is required. Should you make an error when ordering online, Hilbilby will gladly exchange your item for the item you intended to purchase. The returned item must be unopened and in its original saleable condition. You are responsible for the shipping and additional postage charges. We will ensure that we pack your order with the greatest care and consideration of safety. In the circumstance of your order arriving in a damaged state or error of goods received than ordered online please contact Hilbilby Cultured Food immediately to discuss replacement of goods Refunds (if applicable) Once your return is received and inspected, we will send you an email to notify you that we have received your returned item. We will also notify you of the approval or rejection of your refund. If you are approved, then your refund will be processed, and a credit will automatically be applied to your credit card or original method of payment, within a certain amount of days. Late or missing refunds (if applicable) If you haven’t received a refund yet, first check your bank account again. Then contact your credit card company, it may take some time before your refund is officially posted. Next contact your bank. There is often some processing time before a refund is posted. If you’ve done all of this and you still have not received your refund yet, please contact us at info@hilbilby.com.au. Sale items (if applicable) Only regular priced items may be refunded, unfortunately sale items cannot be refunded. Exchanges (if applicable) We only replace items if they are defective or damaged. If you need to exchange it for the same item, send us an email at info@hilbilby.com.au and send your item to: 22 Baines Crescent Torquay Victoria AU 3228. Gifts If the item was marked as a gift when purchased and shipped directly to you, you’ll receive a gift credit for the value of your return. Once the returned item is received, a gift certificate will be emailed to you. If the item wasn’t marked as a gift when purchased, or the gift giver had the order shipped to themselves to give to you later, we will send a refund to the gift giver and they will be notified about your return. To return your product, you should mail your product to: 22 Baines Crescent Torquay Victoria AU 3228 You will be responsible for paying for your own shipping costs for returning your item. Shipping costs are non-refundable. If you receive a refund due to defective or damaged items, the cost of return shipping will be deducted from your refund.